IF you’re in Australia, the start of the new year means it’s time to think about preparing your home or business for storm season. In December, severe thunderstorms hit south-east Queensland and left thousands of homes and businesses across South Australia without power. South Australia’s September 2016 storms cost business an estimated $367 million due a statewide power outage. Heat wave conditions sweeping the eastern states in January can prove just as critical, particularly if you have refrigerated stock. A portable generator can literally be a lifesaver at times like these. In weather emergencies, a generator can help you keep your business running or get your home life back to normal quickly, open communication lines and ensure you can perform essential tasks like pumping water and cooling food. On the flipside, a generator failure can be catastrophic. 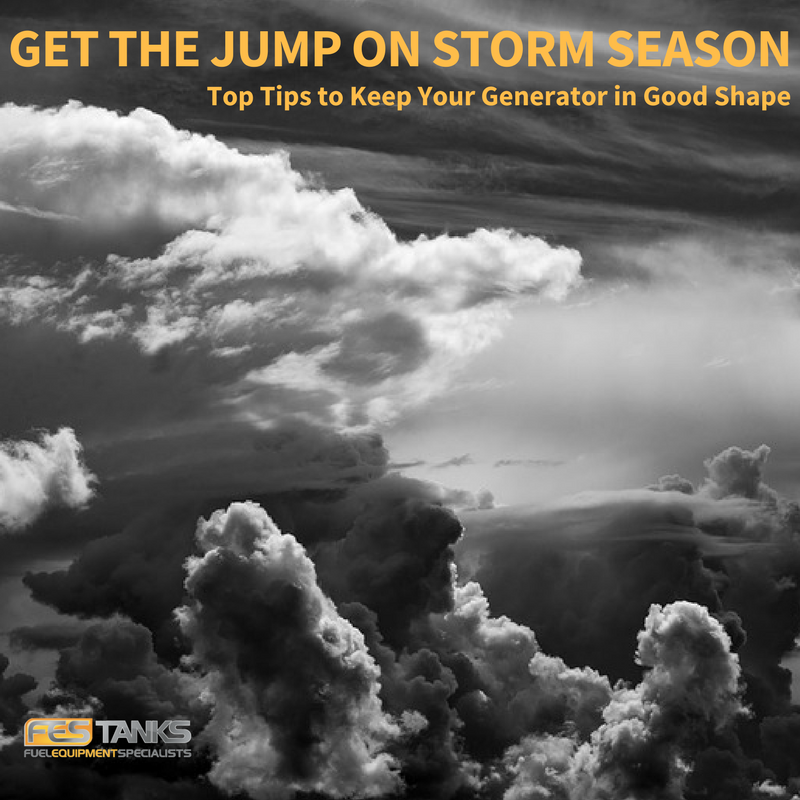 It’s worth taking the time now to ensure your generator is in good working order, which includes cleaning out old fuel from tanks and checking for leaks. If you only use your generator in an emergency, it’s worth taking action to ensure your fuel stays fresh. When fuel sits in tanks unused for months or years it can become stale, and issues like diesel bug and sedimentation can gum up the fuel lines, filters or carburettor. Most fuel only stays fresh about three months in ideal storage conditions, although diesel can keep for longer. If you’re using old fuel cans or don’t keep your cans fuel, your supply could degrade quickly and leave you in the lurch when a storm hits. Check and clean or replace your fuel containers. Small jerry cans or drum storage containers are easy enough to inspect and replace. If storing large volumes of diesel it’s a good idea to treat your fuel with a biocide to keep it fresh and stable and ensure maximum efficiency when you need it. Remove your generator from storage, drain the fuel from the tank and dispose of it properly. Ergon Energy recommends you inspect the fuel line for cracks and replace if necessary. Refill the tank with fresh fuel and run the generator. Plug in some appliances, like a light or a hair dryer, to make sure the generator is working properly. If you have any trouble with the generator during this test, take it to be repaired so it is ready for when you need it. Make sure your generator has enough oil. If it’s been used heavily, it might be time for an oil change. Watch a how-to video here. Ensure you have a heavy duty, weatherproof extension cord that is rated for outdoor use. Check that the cord isn’t damaged or worn. Know your generator’s limits. Each generator has a rated wattage which provides a limit on the appliances it will safely power. Follow the manufacturer’s recommendations for proper use and capacity and don’t try to connect lots of appliances at once. Rotate the use of larger items. Remember, overloading your generator can result in damage to appliances it is powering. There are some basic safety tips that will keep you and your family or business safe if you need to use your generator in an emergency. Don’t plug your generator directly into your home’s wiring. Power from a generator connected to a home’s wiring will ‘back feed’ into powerlines, potentially causing a safety hazard for you, your family, neighbours, and energy workers, and causing possible damage to your generator when mains power is restored. Appliances can be plugged directly into the generator but always read the manufacturer’s instructions carefully. Use a heavy-duty extension cord rated for outdoor use. Always follow the manufacturer’s recommendations for earthing the generator. As petrol and diesel-powered generators produce deadly carbon monoxide fumes, always run portable generators outside the house – never inside or in a garage. Keep generators well away from open windows – including your neighbours’ – so deadly exhaust does not enter the home. A little preparation can make all the difference during storm season, keeping your business operating and ensuring you and your family stay safe and comfortable even when power is lost. To ensure your generator and your emergency fuel supply are stored safe and sound, give us a call the on 1300-651-391.